Give your friends a photo of yourself, or ask for their photo and store it in one of these pre-made photo frames. Think of a creative design that will complement the person in the photo. Use your favourite colour or a colour that reminds you of the person whose photo will go into the frame. Talk about other ways you can commemorate the closing of the school year. 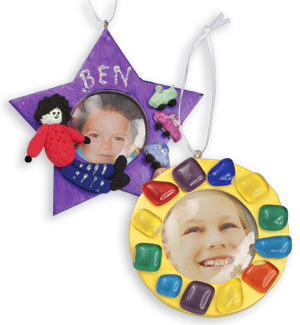 Decorate the Clay Photo Frames by painting with Shimmer Paint and gluing on Glass Mosaic Stones and Magiclay models. Insert a photograph of yourself into the frame as a memento.